i tried my best to put together the most colorful outfit i could handle. usually, too much color tends to scare me. given all the colors in the skirt, i was trying to keep things in a similar color palette. i figured green would be great as a top as it plays off well with the colors in the skirt and it also complements my hair. i am really keen on bringing green back into my daily outfits. i mentioned before that my relationship with different colors is kinda strange, something i like right now might fall into disgrace a couple months from now. this skirt must be the most remixed item in my wardrobe right now, i have worn it in so many combos. actually it sounds like a good idea for a future post to showcase all the different ways i've worn it so far. the yellow tights added a bit of playfulness as this is a bit more lady like than what i usually opt for. but i do love the retro vibe of this whole ensemble. I love it sooooo much that I'm going to post it as modest outfit inspiration of TOMORROW (since I already posted today's). Wonderful!! http://rubyeyedokapi.tumblr.com and later in the week it will be featured in my own blog too. 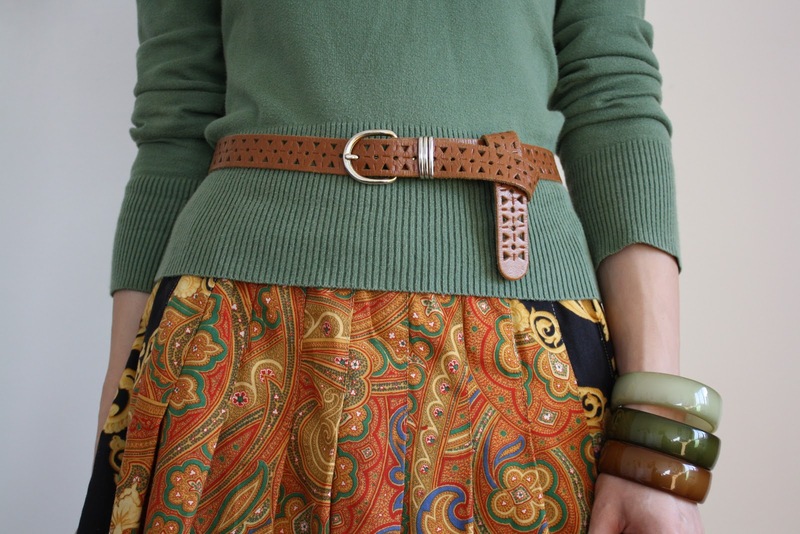 Love the combo of your hair, belt, skirt & tights with the shirt to top it off! Looks great! It's also hard for me to put some colors out, so I really know what you mean! But you've handled it really well! I love that you've kept it in one color palette! Very chic! The bangles are my favorite part of the outfit. It's the little details, ya know? And your hair is amazing! Love it! Here's the post I made and chose your picture for it! hope you like it! wow, love your style(: and awesome blog !!! nice outfits, amazing hair ! adorable.